Specialty Colors are cabinetry  nishes that take your room to a whole new level. Artistic effects are added to popular colors to add character and in some cases, an heirloom feel. 4. abundant worm holes 5. rasping 6. dips 7. light chain distressing and 8. chiseling. They are applied to drawers, doors and throughout the cabinetry. A protective topcoat completes the look. The finish is oven cured for durability. 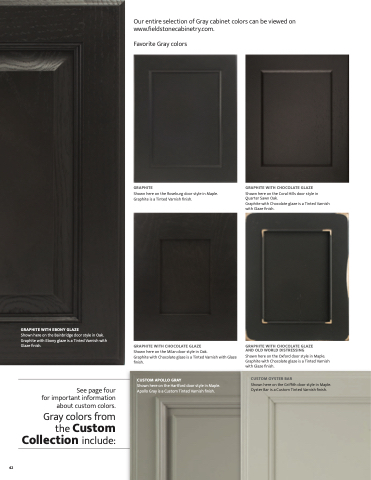 Homestead Fog is available on Alder and Rustic Alder door styles. above This kitchen was created with the Delhi inset door style in Maple finished in Villa Pearl and the Dayton inset door style in Alder finished in Homestead Fog. Standard slab drawer headers were used.